Mission: The Worldwide CARES Committee develops local community relationships through funding and involvement that encourages active participation, teamwork, impacting initiatives, and volunteerism that empowers others. We give preference to supporting opportunities that are initiated by and involve participation from Xilinx employees. Vision: Create global teams and charitable giving programs that sets the standard for providing systemic change and measurable results. 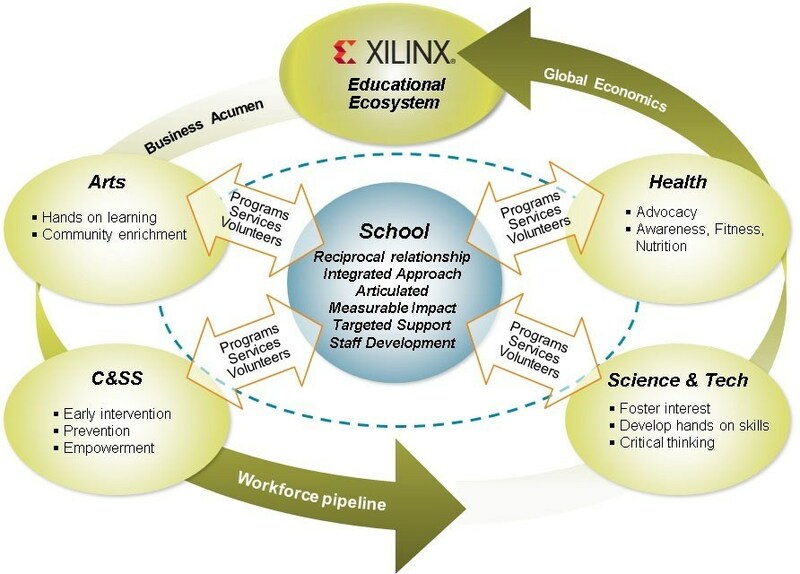 Each year Xilinx actively participates in supporting and improving the community by contributing to the areas of focus listed below. Additionally, employees are encouraged to invest their time in activities that enable them to make an impact in their local community. Education Eco-System , programs that foster an interest and skills development in the areas of math, science, technology, and literacy. Programs that develop a strong foundation for learning by empowering youth with strong self-esteem and personal motivation may also be considered. Community and Social Services, with a focus on programs that promote prevention, early intervention, and empower people to become healthy, productive members of the community through the provision of direct services. Health, identify and support programs or illnesses that typically get little or no funding yet have a dramatic impact on improving the outcome for the patient. Arts, programs focused on educational concepts, hands on learning and community enrichment.